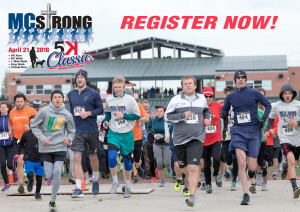 Sign up to participate in any of the following events: 5K run, 5K walk, 1 mile walk, dog walk, or virtual run by April 8th to be guaranteed your race shirt. Thank you for your continued support to Michael’s foundation and doing what you can to help stop drunk driving! See you at the Corn Crib! Thank you to all participants! Good luck!! 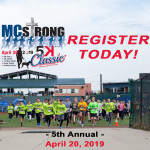 Participants can pick up race packets from 4-­6 p.m. on Friday, April 20th at Fleet Feet or the day of at The Corn Crib from 7:30-­8:30 a.m.
REGISTER ONLINE HERE OR CLICK HERE TO PRINT Registration FORM. “Every day in America, another 28 people die as a result of drunk driving crashes. 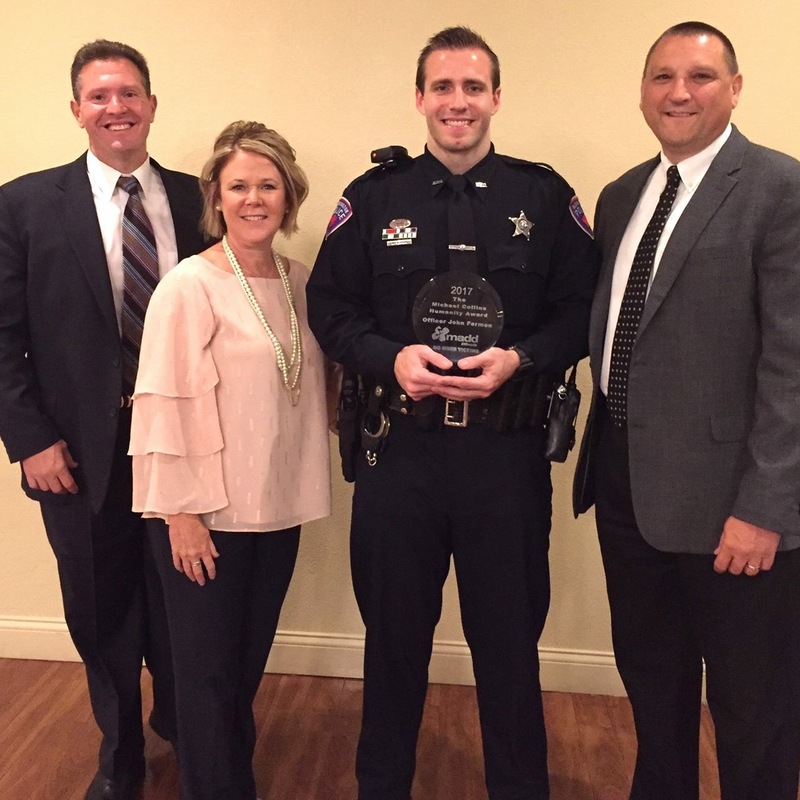 That’s one person every 53 minutes.” On Saturday we attended the annual MADD Heroe’s Award Banquet recognizing law enforcement where Officer John Fermon was awarded The Michael Collins Humanitarian Award. Officer Fermon from the City of Bloomington – Police has made DUI enforcement in this community a passion. In 2016 he set a new record with 107 DUI arrests beating the previous record of 53. He also has the most DUI’s in the department as a total since 1999 and is the only downstate officer with over 100 DUI’s. Officer Fermon was one of the first responder’s on the scene the night of Michael’s crash and the event has had a profound impact on him personally. He stated he is “motivated by Michael,” and that he has been touched to “Pay it forward.” He also volunteers his time to the foundation whenever possible. We could not be more proud of this year’s selection. Congratulations. 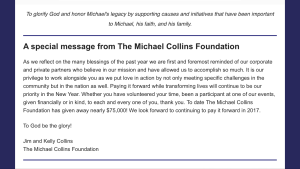 Click on the photo link above to view the 2017 summer edition of The Michael Collins Foundation’s newsletter! 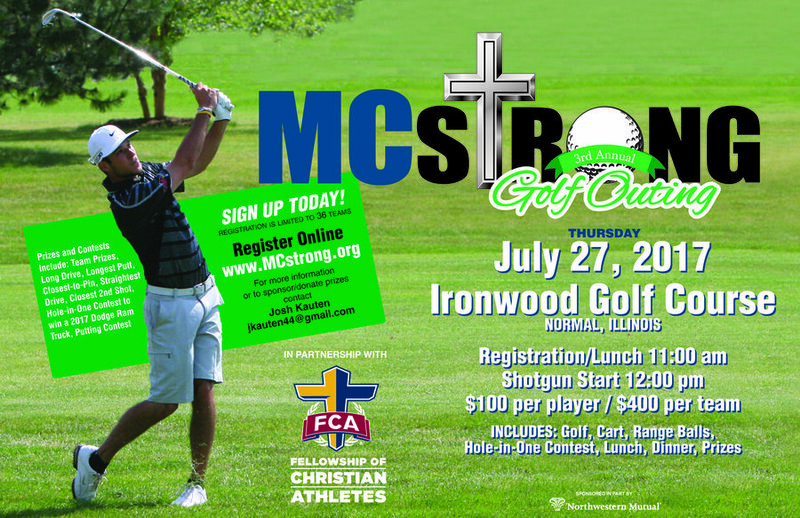 The Michael Collins Foundation is excited to announce we have partnered with the Fellowship of Christian Athletes for the 2017 MCstrong Golf Outing. 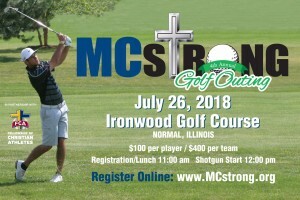 This year’s event will be held on July 27th at Ironwood Golf Course in Normal Illinois. Register a team online here or print a registration form and mail to The Michael Collins Foundation PO Box 19 Hudson Il 61748. Thank you for your support of Michael’s foundation! All games are played at The Corncrib in Normal. Good luck to all teams! Thank you for participating. Registration is LIVE and we have some EXCITING news to share! This year we have added a DOG WALK and VIRTUAL RUN as options to an already great lineup. Upgrading our shirts to Dri fit will be a hit as well. Help us strike out drunk driving and achieve your New Year’s exercise goals at the same time. 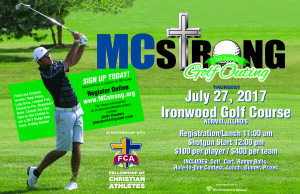 Click on the photo link above to register online or click here to print a mail in registration form.